Simply click on "Targets" at the top of the website's navigation and browse through the various categorys and targets in our online database. 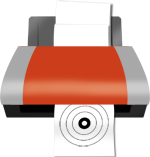 Next, Click on the image of the target you want to print and simply print up your target on your home printer. It does not matter what kind of printer you have, but most of our targets print best on standard 8.5" x 11" paper. Finally, the fun part! Take your target to your favorite range or shooting location and punch some holes in your new target!! 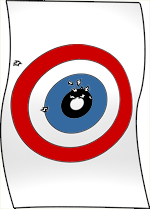 PrintFreeTargets.com started out as a website devoted to publishing free, printable targets that have been made and designed in-house. Our targets typically cost a fraction of what one would expect to pay when buying them at a range. In fact, for most people targets will typically cost between $0.01 and $0.04 USD to print. Of course these estimates only take into account the cost of ink and paper, but it's fair to say that for most people those estimates will be very close.